Valet Parking available for $20 through Prieve Parking Valet. There is limited street metered parking. Sunday, free meter and residential parking. We do offer 2 semi-private dining areas that accommodate a maximum of 12 guests in each of these alcoves. Owner Brian Piccini and Chef/Owner Christopher Coombs are proud of their award winning Restaurant & Bar, Deuxave in the Back Bay. The inspiration behind the restaurant’s American Nouveau Cuisine is seasonality, with a focus on working with the finest farms and purveyors, sourcing out the freshest, local ingredients and amplifying their magnificence. The cuisine is strongly rooted in the nouvelle techniques of contemporary French cuisine, married with the splendor of American ingredients in a refined, but casual setting. Deuxave’s (pronounced doo-ave) name plays homage to its location at the corners of Commonwealth Ave and Massachusetts Ave. 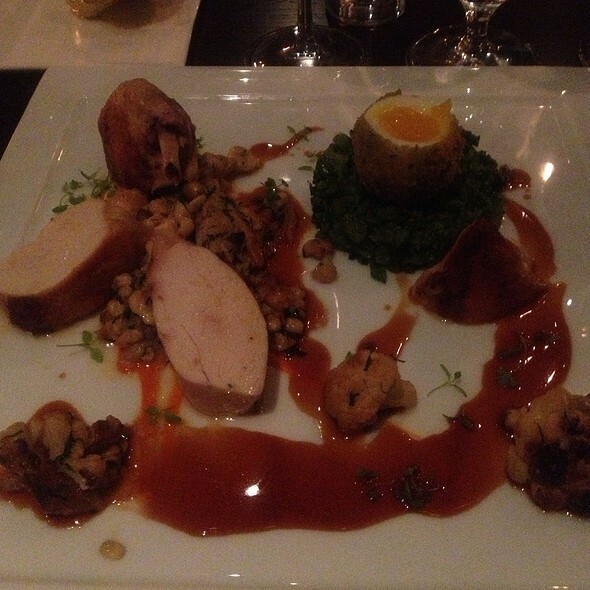 I came for a birthday dinner and Deuxave's service and quality of food may the night so special and memorable. The duck is truly a dream. The foie gras was divine. The bubble bath cocktail was also a true creative concoction. The only complain I have is that when told the duck breast would take a half hour, I changed my order to pasta. We still had to wait a half hour for our dinner. The management was nice enough to compensate us however, so we would gladly return. This is the only time we have had a problem there. Amazing!!! The food was outstanding and the patio was so beautiful. The chicken was the most tender I have ever had. 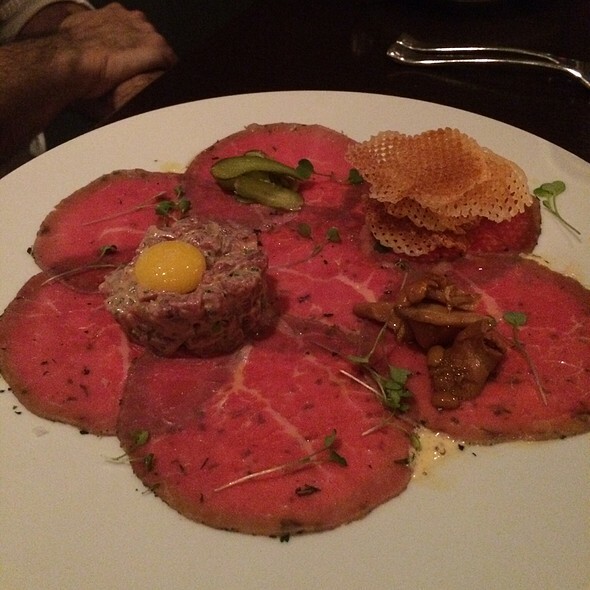 Also highly recommend the carpaccio. Fantastic meal! This was a very good restaurant with a nice atmosphere. The service was very professional and friendly, the food original and well thought out. The wine list was thorough and offered some good choices. only for special occasion or a way to treat yourself, otherwise you’re loaded ! Have the truffle chicken for two. Fantastic. Charming and warm place—amazing food—great night! Look forward to returning. Awesome wine list! Wonderful food and service. Atmosphere needs to be updated. Felt it was dreary. Bathrooms not very clean. Surprised how patrons were dressed down in jeans, sneakers and sweat pants. Almost every table was on their cell phones. 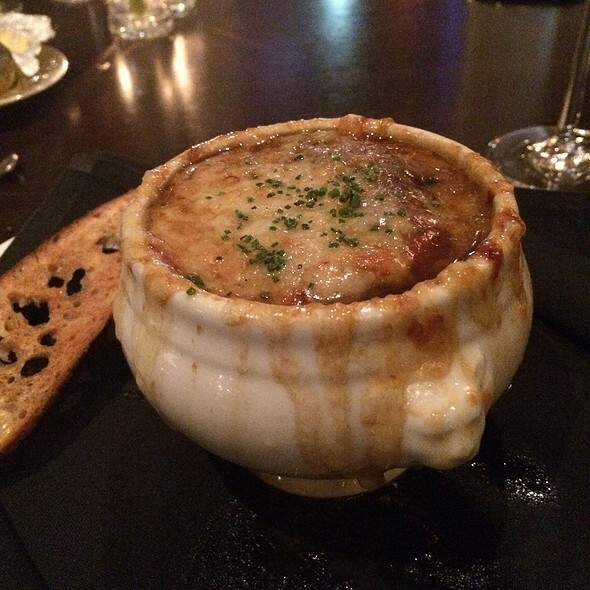 We dine at DeuxAve regularly for special occasions and it never disappoints!!! Excellent on all levels! We would love to say we had a great dinner. We had a $100 gift certificate from a poor experience the last time that we went to Deuxave and saved it to use for our 35th wedding anniversary celebration as we fully expected that last time was just unfortunate. We had a great waiter and a great table and we were really excited to try the special which was truffled chicken. We voiced a concern to the waiter that lately truffle dishes in other restaurants did not taste much like truffle but he assured us that it was in fact filled with yummy black truffles. The dish was brought to our table for us to look at and then carted away to be carved into two servings. We waited and waited until we finally asked the waiter where it was. It appeared about ten minutes later and had zero truffle smell or taste and it was extemely dry. Sadly we sent it back and ordered soup and a duck dish which was ok not amazing. We are so sad as we always loved going to Deuxave and hope that it improves soon. First time dining here. Had a drink at the bar while we waited for our table. Bar service was a bit slow but it’s a nice bar to sit at! Our waitress was professional and knowledgeable and made some great recommendations. 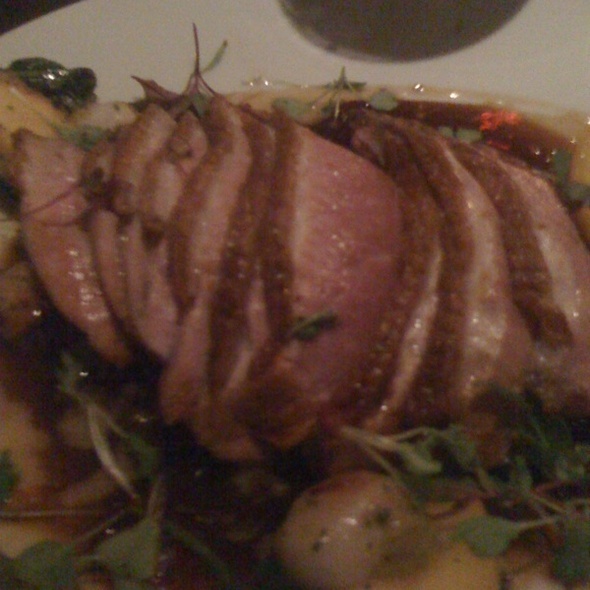 The duck entree was excellent and the foi gras melted in your mouth. A great dining experience. The ambiance was a bit off. Loud and not the best for the romantic feel. The food was okay, not worth the price. Would not return for a special occasion or most likely ever. People were not dressed per dress code and just the loudness, casual dress took away from the unique restaurant experience. The dining room is beautifully appointed; very attractive and comfortable and is spotless with high windows looking out over Mass Ave and Commonwealth. 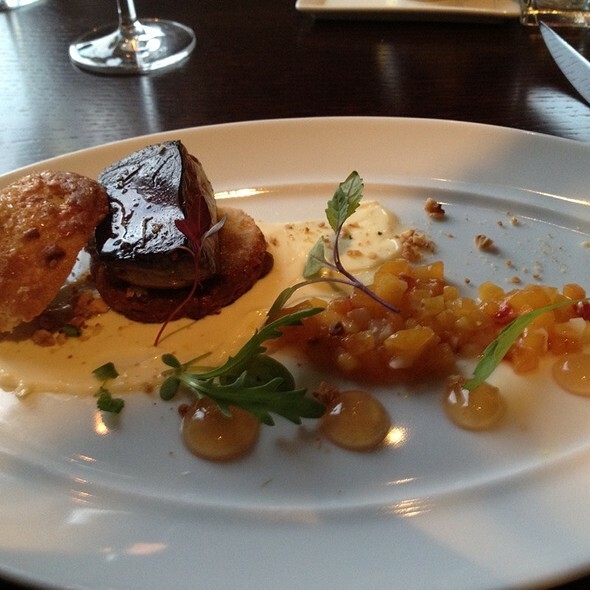 The foie gras was exceptional - one of the best I’ve had. Our other dishes were quite good but not off the charts. However, no complaints other than being quite pricey. With cocktails, a bottle of wine; and an appetizer, and dessert (we shared one of each between us, plus our two entrees), you can easily spend over $300/couple. Service is excellent. We should have been warned by the wait staff that it was going to be interminable. I dined at Deuxave alone this evening due to a last minute change of plans in my husband’s travel. I was treated as a whole party from the beginning, given a lovely table with comfortable chairs. Perhaps the fact that I am 8 months pregnant with twins factored into it but if so, I didn’t feel that. The host stand staff were polite and efficient. The bathrooms were lovely and the general ambiance of the restaurant is understated but elegant. I had a passion fruit mocktail with house made vanilla simple. Very nice. I enjoyed the chef’s tasting menu and just mentioned that I am pregnant but would trust the chef and eat my steak medium rare. All the food was fantastic. First time there! Great restaurant. The entire experience was amazing. Will definitely come back. Our meals were delicious and presented very nicely. Quiet, relaxing atmosphere. Efficient and unobtrusive service. Incredible meal! Everything was stellar! And the chef owner is not only impressive, but also very philanthropic. 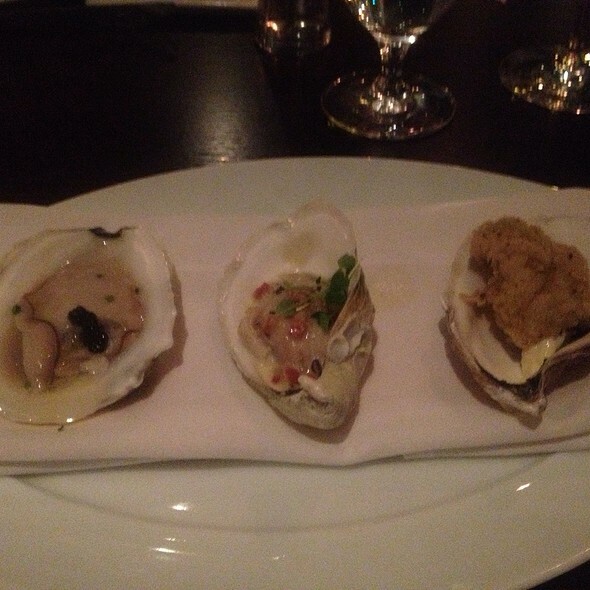 I have eaten at Toro, Uni, Branch Line and B&G Oyster in the last week. I chose Deuxave to celebrate our son's 18th birthday. The waiter was nervous, didn't know his own menu, dropped and smashed a glass on our table, didn't respond to a request to ensure the champagne was served "really cold". The truffled salad my wife selected was good. The pork dish I ordered was shockingly bad - cold, dry and presented on a dirty plate, smeared with marks (looked like it was washed in cold water). I am amazed an establishment like this can survive. This was memorable for the all the wrong reasons - don't go. 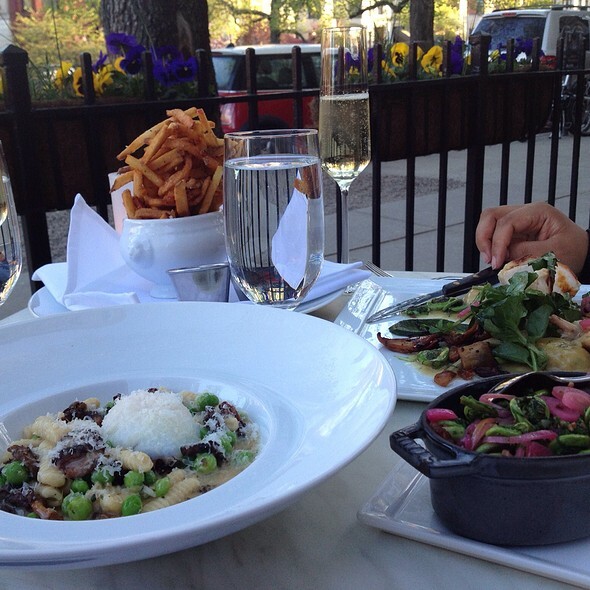 Walk over the street and eat at Uni and have an experience that you will relish and remember for good reasons. I would imagine the leadership is weak at this establishment. We were celebrating an engagement. The wait staff were exceptional. The meals were elegantly served and were delicious. Portions were smaller than expected. Overall, a wonderful experience. The wine list has its price much more higher (more then 10x) when compared to to other French restaurants, as well as the varietals choice was to small for a “French” restaurant. Too noisy, chairs not comfortable but the food was fantastic. Excellent new spring menu options. Loved the pork dish and the sole. One of the best upscale locations in boston. Fantastic food but odd service. Greeted by one server, then another took drink order and filled-in on specials, and a third took the actual food order. The problem is that the third server didn’t know how the prior server presented the specials. So when I had a question, she was unfamiliar with the situation and the second server had to come back to the table. Everything was fantastic. Great food with great ingredient combinations. Loved the pate' and the chicken with rye fettucine. Great job! The staff was friendly from the hosts (hostess) to the bar and our server. Thanks! excellent staff, food and service. I was only here for a visit but if I lived in Boston this would be my go to restaurant for dining. Outstanding restaurant with great food and service. Beautiful space! Excellent food and overall layout. The head server was great, but the other servers (who brought out the food) basically placed it, mumbled what it was, and walked away - not a great experience when you're doing the Chef Tasting menu. Hopefully it was just a couple of servers who need more training. 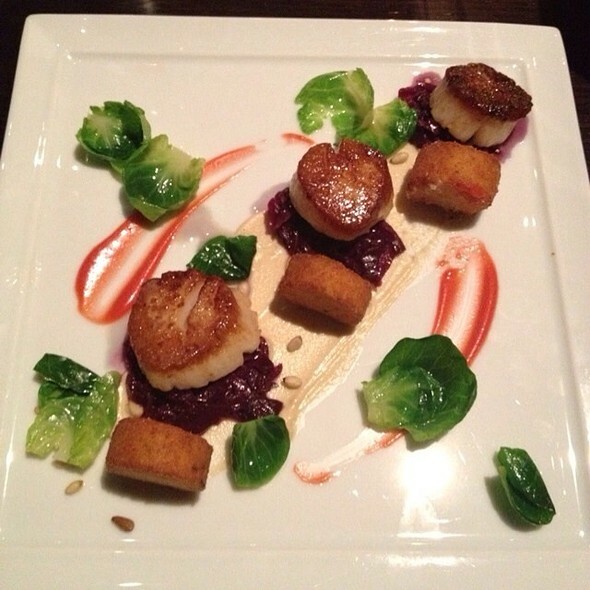 Deuxave has been my favorite restaurant since the first time I’ve dined there. The food is outstanding and the service is always friendly. Thank you so much for a great experience! Exceptional restaurant! Great service, tasty food, and a lovely atmosphere! Deaxeve is not a good restaurant for parties of two. All the prime tables are for parties of four or more. We noted on the reservation that we were there for our anniversary. I asked for a nice table. Instead, we were seated at a tiny table in a back corner/alcove. We were seated next to a six person group that was very loud and perhaps intoxicated. We could barely hear one another. We waited about 40 minutes between appetizer and meal. The server apologized for the delay, and normally we wouldn't have minded, but the party beside us made us want to leave. Anniversary dinner. Warmly welcomed by Emily at the door (also awarded a small flute of champagne to celebrate). Arthur, terrific server took great csre of us: despite relatively new, knowledgeable in menu and preparation, just the right amount of interaction. A beautiful ambiance and lively without shutting down conversation. Overpriced for the size of the portions, but an engaging and inventive menu. Better than I expected. I would place it as one of the top French restaurants in Boston/Cambridge. Our waitress was very professional, but friendly. GREAT bar & bartender. creative menu. solid service in dining room (unspectacular but attentive). food very good overall (great salads, very good chicken entree, bland duck entree & disappointing soufflé), but it should be ‘wow!’ food given how nice the setting & menu are. still, a great evening & we’ll be back. I returned to Deuxave last night for the first time in a couple years. 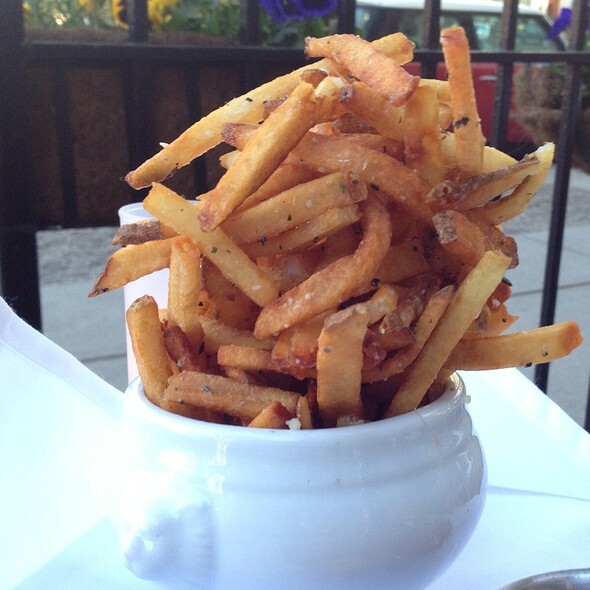 It is one of the most chic, elegant, and expensive restaurants in Boston. The food is good, and last night, the service was impeccable. But there comes a time when price exceeds any possible threshold of quality, and this place is over that top. I left the restaurant hungry, and I had bread, salad, an entree, and a few bites of dessert. The biggest offender was a $48 sole entree that I ordered, expecting to have enough to take home. Alas, the piece of fish that arrived was (no kidding) one inch wide by about 6 inches long, and it was sitting on a bed of sauteed cabbage. With it were about 4 pieces of halved cooked new red potato. I figure the dinner came in at about $5 a bite. Sorry, but we are talking about sole-- nothing rare or difficult about that. So until this restaurant comes down off it's pretentious tower, and serves you enough food so that you don't leave hungry after paying $100 a head, I can't recommend it.